Few years back internet users had monitors with almost same screen resolution. Web designers were used to design websites for same screen resolutions and their task was easy. But now the scenario is different. Now users have different devices to surf internet. The devices may be desktops, laptops, tablets or smartphones and all these devices have different screen resolutions. Web designers now need to make their designs compatible with most of the possible screen resolutions. It is not feasible to test the designs in all of these devices but a web designer can re-size the browser as per the screen size of particular device. There are many online tools, Firefox add-ons and Chrome extensions available to test your designs in different screen sizes. These tools will make your task easier to check how your website looks in different resolutions. ResizeMyBrowser allows you to quickly resize your browser window to any of the pre-defined resolutions. The pre-defined resolutions are of Smartphones, Tablets and Laptops. If you want to use your own size then you can define a new preset. You can also delete your defined preset. Screenfly allows you to view your website on a variety of different screens and resolutions. Enter the URL of a website and hit Go to get started. Screenfly has options to view your website on a variety of Desktop, Tablet, Mobile and Television screens. ViewLike is an online tool that lets you test your website in most popular different resolution formats. You just need to type your URL in the provided box and hit the “Check up” button. The design can be easily checked in standard screen formats. TestSize.com is really easy to use tool to test your website in different screen sizes. Simple enter the website URL, select a screen size from the drop down list or enter your own screen size and Hit on Open Popup button. A new pop up window will open with your selected screen size. Firesizer is a Firefox add-on to re-size your browser window to test your website in different screen dimensions. It adds a status bar. You can look at the bottom right corner of your browser to see your current window size. You can also right click on the Window size panel to see other available dimensions or add your own dimension. Yet Another Window Resizer is really easy to use Firefox add-on to re-size browser window. You just need to right click any where on the web page and select the screen size. 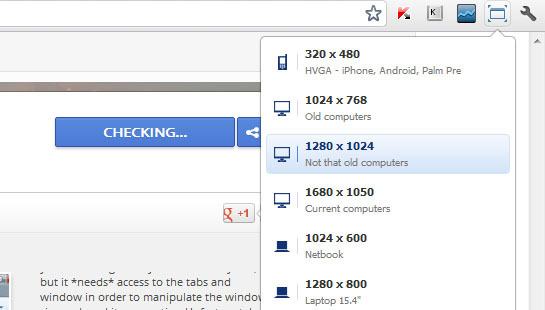 Resolution Test is a Chrome extension to test web pages in different screen resolutions. When you install this extension to your browser, just click on the test icon on the top right corner of your browser and select single or multiple resolutions to re-size your browser window. 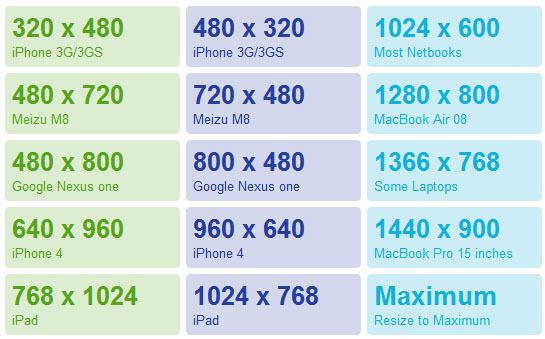 It includes a list of commonly used screen sizes. You can also define your own screen size if your desired size is not available in the list. Window Resizer is same as Resolution Tester. It also has some pre defined window sizes that you can use to re-size your browser window. Like Resolution Tester, It also allows you to define your own sizes. Thank you for sharing these tools for testing the website in various resolutions Simrandeep Singh. Nice websites, I think this tools can help to check our website page layout in different screen resolution. These online tools help solve the testing needs, and now the screen resolution can be altered which can be suited to all devices. Screenfly is my favorite. Used it while customizing my WordPress theme. Thanks for sharing this tool, I like Screenfly tool. Thanks for the info, will give it a shot to improve my screen resolution. Thanks again! I am a website developer and i know how difficult it is to create a web app that works fine in all supported browser and all possible resolution. Thanks for your sharing….it will help the developers like me. Thanks for Sharing Valuable information about test websites in different screen resolutions. O! Really for the first time tried in different browser ! I think it will help us to test the design compatibility with low and high resolution and detecting anomalies due to the screen size. is it possible to view the pagein Full Screen (F11) in customized resolution?